Modern 2.0T Audi models come from the factory with a power robbing OEM turbo muffler to reduce turbocharger harmonic noise. 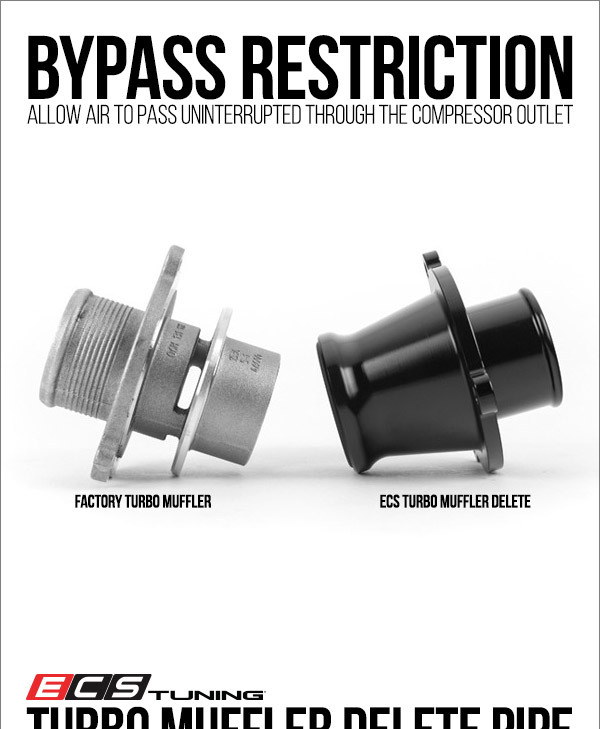 Many have developed a simple method of bypassing your restrictive factory turbo muffler with a single billet aluminum piece. The Turbo Muffler Delete eliminates the vented OEM muffler tube, allowing air to pass uninterrupted through the compressor outlet. This dramatic increase in airflow allows the turbo to operate more efficiently while enhancing the sound characteristics of your engine. What year did they start putting the muffler on? SALE! ECS Intakes are ON SALE!